Build an autonomous robot that will go back and forth the specified route in the shortest possible time. The winner will be a robot that comes as close as possible the goal with the lowest time. The competition is only for ground robots that the track must pass without any competitor intervention. This competition can be viewed as a training for traditional and challenging Robotour competition, or a bit easier Robotem rovně (Pisek, May 11, 2019). Succesfull run in this contest is also valid for Robotour Marathon. The competition track is defined by start/finish and point of turn, whose GPS coordinates will be published at least 10 days before the competition. 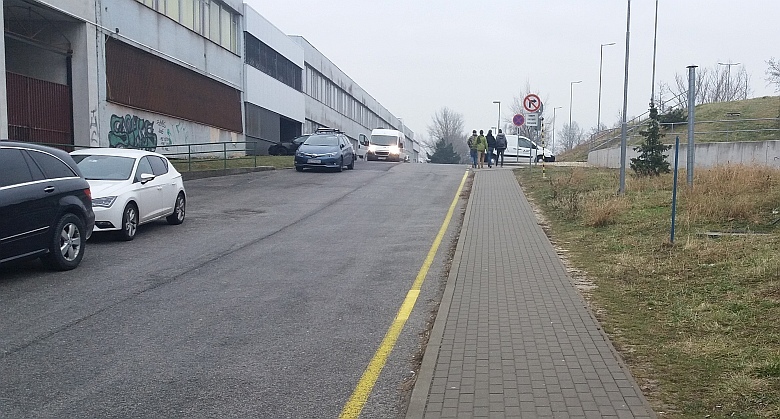 Both points will be located in the vicinity of the Faculty of Electrical Engineering and Informatics of the Slovak University of Technology in Bratislava. The track is straight, with no twists and turns. The track surface is made of asphalt and concrete pavement. The road is approximately 3 meters wide and its length will be 2 x 150 meters. The elevation is approximately 5 meters. The contestant may choose to move a raised path (pavement) or a path (asphalt). The start and turning points will be indicated by orange road cones. The robot starts anywhere in front of a line running perpendicular to the start point and must be turned anywhere behind the same line at the opposite end. The robot must go all the way through the line. An example of one possible track segments. Because the track will not be closed to the public during the competition, there will be randomly parked cars that the robot must avoid. Random pedestrians can walk along the road and sidewalk, and the robot must also avoid it. The robot may decenly ask pedestrians to free the path. Another competing robot can become an obstacle on the road. We will try to avoid this situation with appropriate start intervals, but we cannot completely exclude it. The robot can either wait until the robot disappears or it can bypass it. In the case that both robots are stalled, the second one can ask for finishing the attempt and free the way. To time measurement this situation has no effect. The robot must be autonomous and must not interact with its owner since the start to finish. You can use GPS to navigate, or map the route beforehand. Is possible also use the yellow line (horizontal traffic signs V12b, according the law 9/2009 Z. z.). It is also possible to train the route in advance either visually or using an odometry. The robot must be able to stop before the obstacle or to avoid it safely. Dimensions and weight are not limited. Maximum speed of the robot is 2,5 m/s. Compliance with safety rules leads to disqualification. Equipment and operation must comply with applicable legislation. Each competing robot must have at least one master switch that is clearly identifiable and achievable. It has to be placed in reach of the adult human and has to switch off the robot immediately. The safety switch has to power off the drives. The color of the switch is red, it must be a fixed part of the robot and it must be placed within reach of an adult. If the situation is evaluated by the judge judges as dangerous, they can stop the robot at any time. If it is later re-evaluated as safe, it is possible to swoth the robot on again to complete the attempt. This activity has no relation to time measurement. All participants participate in the competition voluntarily and at their own risk. The organizer assumes no responsibility for damage to robots nor damage caused by them. the robot must comply with all safety precautions. Based on the results of the homologation and agreement with the competitors then the referee will determine the starting order. The competition will take place outdoors, in any weather. It is the competitor's responsibility to secure the robot against external weather conditions. The organizer is not liable for any damages. In the case of a low number of participants it is possible to wait until the end of the previous attempt. If the situation does not allow it, the robot must start at the direction of the referee. On the basis of the time schedule of the competition and the number of participants, the starting windows will be defined during which the robot's ride will be evaluated. They will not be allowed to train during them. Every attempt ends at the moment of the first human intervention. The referee measures the distance traveled and writes the time. If a contestant wants to, he can finish the ride with the help of remote or manual control and use this to try and improve the robot's features. In so doing, however, it must not hinder or hinder the driving of other competing robots. The attempt also ends when the robot leaves the track. The distance is always measured perpendicular to the road. Leaving the runway means that the robot does not have at least two wheels or one lane on the road. The attempt ends even when there is an imminent damage to property or people. In such a situation, the robot stops the referee with the main switch and decides on the spot whether it is possible to continue the attempt. Each robot can run a total of 4 times on the track. From each round, the length of the autonomously traversed route is recorded with an accuracy of 1 m and the time in case of undecided results. When measuring time, the number of obstacles the robot encountered on the route is not taken into account. The winner will be the robot, which will go the longest distance, or in case of equality of distances, for the shortest time. In addition, the jury may award additional prizes at its discretion - e.g. for the most obvious design, the most elegant design, and so on. And, of course, all common rules also apply.